Your knee moves freely backwards and forwards; however the thought of it moving from side to side probably makes you cringe. This is because the knee joint has sturdy ligaments either side of it that prevent sideways movement. Of course, we instinctively know that a lot of force would be required to shift it in this direction. The ligaments on either side of the knee are called the Medial Collateral Ligament (found on the inside the knee). 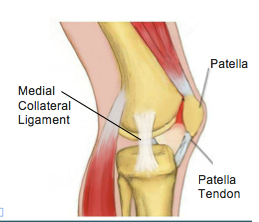 The Lateral Collateral Ligament (found on the outside the knee) and they each work to provide stability and restrict the knee’s movement into a sideways direction. The typical mechanism for this injury is a force that drives the lower leg sideways away from the upper leg. This can occur from an awkward landing from a height, or when twisting with a foot fixed on the ground or from an external force hitting the outside of the knee, such as with a rugby tackle. MCL tears have quite a distinctive set of symptoms, with pain and swelling noticed quite specifically to the inside of the knee. The severity of the pain and swelling will be related to the number of ligament fibres damaged. Larger tears will also make the knee feel unstable or loose. To classify the severity of the injury and help to guide treatment, a grading system is used. With grade 1 indicating that a few ligament fibres have been torn and grade 3 used for a complete tear of the ligament with associated joint laxity. Very severe MCL tears often also involve injury to the medial meniscus and ACL and can require surgical repair. However, most MCL sprains can be managed well with physiotherapy. Grade 1 and 2 MCL sprains take between 2-8 weeks to fully heal and a complete rehabilitation program is strongly recommended to prevent future injury. In the early stages of the injury, treatment is focused on pain and swelling management, while allowing the body to start the healing process through inflammation. This is best managed thought the R.I.C.E. principles (Rest, Ice, Compression and Elevation). Following any injury, it is natural for muscles to waste a little and the damaged tissues to lose what we call proprioception, the ability to sense their own position in space. This loss of muscle strength and proprioception can contribute to further injury if not restored with a proper rehabilitation program. Physiotherapy also aims to restore movement to the joint and support the ligament while healing to ensure that it is strong and healthy, and the scar tissue forms in an organized fashion, which makes the new ligament as strong as it can be and protects against future tears. None of the information in this newsletter is a replacement for proper medical advice. Always see a medical professional for advice on your individual injury. If you require professional advice or treatment, please see our range of treatment options, or book an appointment online. Physio Direct has many clinics located throughout New Zealand, with no GP referral required to make an appointment.